Bloomington Craft Beer Week… beer events worth visiting Bloomington for! Bloomington Craft Beer Week starts Saturday, April 5 continuing through and after the Bloomington Craft Beer Fest on April 12. It is #drinkindiana week! Many local places will have Indiana beer on tap starting April 4! So maybe you went to school in Bloomington or maybe you’ve driven to Bloomington on a scenic trip to Brown County, Indiana. You fondly recall the quaint town square, maybe a pound of beer (their word for pint) at historic Nick’s English Hut, the beautiful limestone buildings, and a warm Spring Day. COME ON DOWN and have a pint of beer or two sometime this week. Revisit, refresh, and reacquaint with a town and its love of quality craft beer! Bloomington Brewing Company, the 20-year-old that was the first craft brewery in Southern Indiana has been a draft-only brewery but kicks BCBW off Saturday with the release of beer in bottles by offering 22 oz. “bombers” of gold-medal-award winning Rooftop IPA at the Big Red Liquors big store at 8th and College Ave, Bloomington, with brewer appearances from Noon to 2:00 PM April 5! 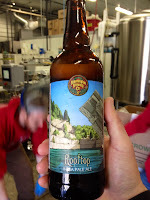 Rooftop took gold in the IPA category of the most recent Brewer’s Cup Competition, Indiana State Fair, which receives commercial entries from multiple states as one of the largest competitions in the nation. BBC brewers and staff will be at Big Red Saturday and would be glad to sign a bottle or chat about beer. 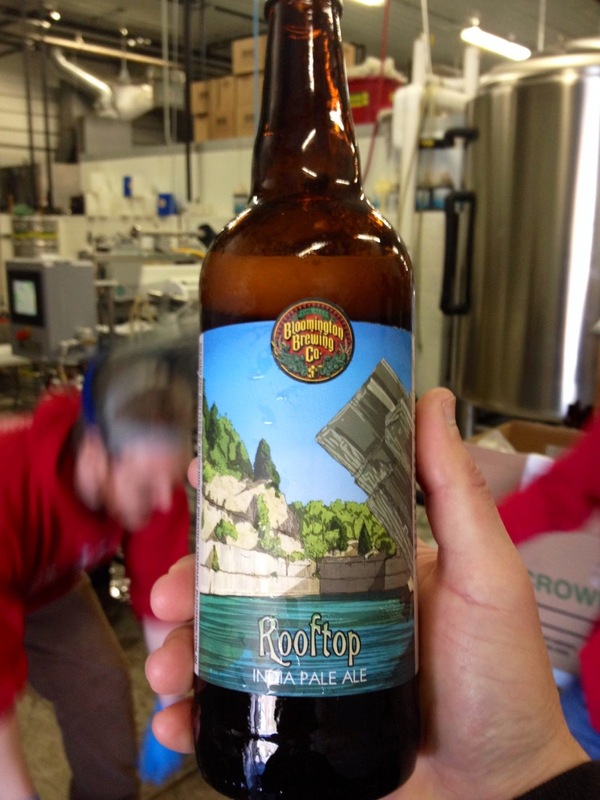 Rooftop bottles start selling at Big Red and will eventually expand throughout central Indiana. This brew delivers the hop forward and balanced IPA that offers both citrus and pine notes with a bitter finish while still balanced with malt. Rooftop will be the first commercially available ‘bombers’ in a series that will eventually (think Summer) include Ten Speed Hoppy Wheat and Ruby Bloom Amber. Get B’ton Craft Beer Week started off right by celebrating this historic moment! Get one of the first bottles ever produced! Indiana brewery Flat 12 pours beers, passes on information, and provides ‘swag’ at legendary I.U. pub Nick’s English Hut Saturday night at 7PM offering limited edition Pogues Run Vanilla Porter, a flagship Flat12 beer with vanilla beans that opens with big vanilla notes backed by the solid hearty roast of this favored porter. Flat 12 beers on tap also include Half Cycle IPA, Walkabout Pale, and Hinchtown Hamer Down Golden Ale. Bicycle tour to 3 breweries starting at Function Brewpub on 6th starting at 10:30 AM continuing to BBC, and Upland. Upland rolls out their collaboration with New Belgian Brewery sampling “Light Synth” and “Dark Synth” at 6:00 PM. Dark Synth to be on tap along with Upland’s new Haystack Lightning American Wheat (the 2nd beer in the new Side Trail Series), Campside, and Wheat plus New Belgian La Folie, Le Terroir, and Snapshot Wheat. Bloomington Brewing, Cutters Brewing, Quaff On!, and Upland will pair beers and food for a candlelight brewery dinner at The Root Cellar inside The Farm Restaurant, at 6:00 PM. A four course meal will pair with Cutter’s Knobstone Pale, BBC Rooftop, Quaff On! Java the Red, and Upland Wheat. $49 per guest. Phone (812) 323-0002 for details as space is limited. Function Brewing, Bloomington Brewpub taps a test batch of single-hopped pale with Falconer’s Flight hops plus a version adding Mosaic and Citra Hops. Upland and Oskar Blues at The Tap Beer Bar, 7 PM, with Wheat, Champagne Velvet, and Campside. Oskar Blues beers: White Buffalo West Coast IPA, Dales Pale Ale T45 – dry hopped Dale’s Pale, Dales Pale Ale T90 — another dry hopped Dale’s Pale – each beer has a different hop kettle additions. Upland holds their beer & music focused Vinyl Release Party at their main Bloomington Brewpub (banquet hall) 5-8PM featuring Vinyl Tap Rye Pale Ale with part of the proceeds from the beer sale going to local community music. All Upland locations start revealing the new Upland logo and look starting April 9. Cutters Knobstone Pale Ale will be the featured Friday beer along with Upland Wheat on tap at the Alley Bar on Kirkwood. Atlas Ballroom Bar on South College will pour offerings from Cutters, Mad Anthony, and New Albanian. Player’s Pub on South Walnut will feature Tin Man (Evansville) beers. Then get ready to PARTY at many local venues AND save your wristband for a special deal on Sunday! Sun King tap takeover and after party at The Tap Beer Bar on the square with Timmie RIS, Batch 666: Sympathy for the Devil (Belgian-Style Black Ale loaded with chocolate, roasted walnut, and banana flavors), Batch 777: Touched by an Angel ( Belgian-Style Tripel), Big Iron Barleywine, Moonlight Serenade toasted oatmeal stout, and Fistful of Hops. Max’s bar on the square will have a kill the keg party with BBC Rooftop IPA and Kirkwood Cream Ale where the person to get the last pint gets a Max’s gift card. Fest Wrist Band Day at Lennie’s Restaurant and Brew Pub 10% off Sunday Brunch at Lennies – Beer Fest attendees get 10% off their meal with their Beer Fest wristbands. Cheers & hope to see you at an event! Next → Next post: Breweries Converge on Bloomington for Bloomington Craft Beer Week and Festival!